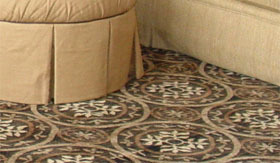 From time to time when we are working with a customer on a new area rug, interesting stories will come to light that are worth sharing. We had a couple in Leawood, Kansas who had just purchased a lovely two-story home which had beautiful wood floors throughout, but what really caught their attention was the featured staircase centrally located and just off the main entrance. Now everyone loves the beauty of a well crafted staircase, unless maybe you have four short legs. This was the problem that we were called upon to solve. Our customers had the choice of showing off the wood of their staircase at the potential hazard of their little beagle puppy. Worse yet, these slippery steps were so intimidating for the dog that he would sit at the bottom and howl up the steps until someone came and carried him up. We become so attached to our pets and for this couple, their furry four-legged friend was no exception. Since bringing him home, he had captured their hearts. Since it was not easy for this beagle to negotiate these wooden steps and a nasty fall, with the associated veterinary bills, was simply not an option, they gave us a call. What could they do that was affordable, yet still accentuated their staircase? 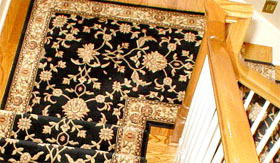 Chris Bradford, owner of Area Rug Dimensions said, “It was really just a matter of giving something that the dog could grip and have some confidence on the stairs but at the same time, blend color and pattern to match the home’s decor.” The result was a custom, machine-made stair runner in a black Bhokara pattern. 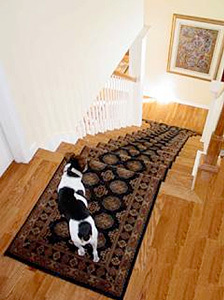 Installed so that it would not slip, the runner not only beautified the stair case, but resulted in one very happy beagle. 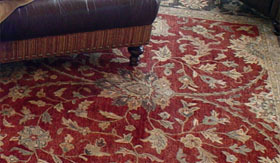 For this couple it was an easy cost justification – pay to beautify their home or pay a vet to take care of their dog. 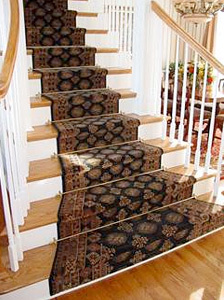 You might not believe this, but over half the stair runners we custom make and install for our customers is because their pet is too old or too young to handle wooden stairs. 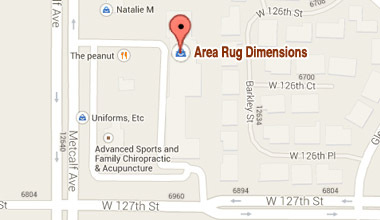 Let us come in and save the day for you. 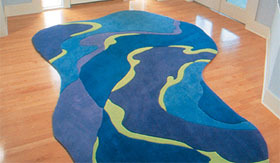 You can reach us at 913.327.8784 or find us online at www.arearugdimensions.com.